With the harsh winter cold, people tend to focus on skincare and wrapping up warm. There's nothing wrong with that, but something that shouldn't be neglected is your lips! You use them every day - eating, drinking, talking, kissing - and yet, many people forget that they still have to take care of their lips! I used to be one of those people, until I got myself into an easy routine. Here are my lip essentials! Just like everywhere else on your body, you need to exfoliate your lips to keep them healthy and glowing. When I was younger, I was told by some kid at school that if you used your toothbrush on your lips that it made them smooth and eventually they would get bigger. Well, they never got any bigger, but they did get smoother, and I guess that's how I was introduced to exfoliating my lips. Nowadays, I don't use my toothbrush. My favourite thing to use is Lush's lip scrub in Bubblegum. Put a tiny bit on your fingers, and rub in small circles on your lips. It smells incredible, and if any gets in your mouth, tastes great! They have mint and popcorn flavour too. A lot of reviews that I've read have people saying that they just lick it off after they're done. That's all well and good, but not only are you licking off the scrub, you're licking off a bunch of dead skin. No thanks. I have a whole bag full of lip balms, and they're all great in their own ways, but I always come back to my absolute favourite. Vaseline lip therapy with Cocoa Butter. It's a good size, and a little goes a long way, so it will last quite a long time, even if you use it every day. Despite this, I'll still buy all kinds of lip balms, because I have no self-control. Vaseline is obviously a heavy duty, pretty oily moisturiser, so I would not recommend it if you want to wear it under or over any lipstick. If you want something for that, I'd go with something like Chapstick's Mixstick in Strawberry and Banana, or a plain and simple Nivea Essential. Just use a small amount under any matte lipsticks, and you'll find it doesn't dry out so badly. I adore dark winter colours. Even in the height of summer, I'll still wear a dark brown lip, because I can. My favourite winter colours this year have been Sin by MAC, and Androgyny by Jeffree Star Cosmetics. Although Androgyny is my favourite, I could talk for hours about how much I love the Jeffree Star Cosmetics line. The holiday collection is to die for, and his matte lipstick formula is spot on. Sin is a colour I picked up in Florence, when I tried (embarrassingly) to ask for a lipstick in Italian. It's a rich, dark red colour, and akin to the colour of a full bottle of red wine. It's just beautiful. Like Androgyny, Sin is a matte finish, and long lasting. Perfect for a winter day out! If you’re not about a dark lip, and want a mid-winter pick me up, Candy Yum-Yum by MAC is a gorgeous bright pink lipstick. It’s matte, vibrant, and the perfect antidote to any torrential rain that we’re bound to have. 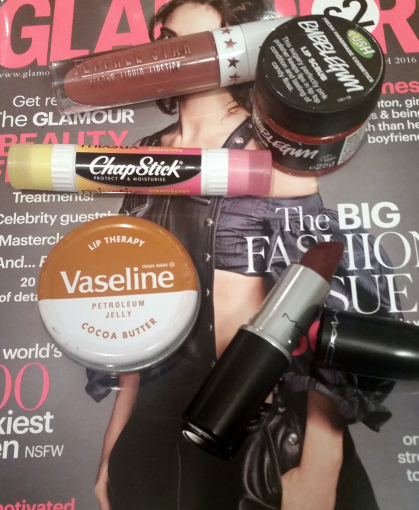 And there you have it – my lip favourites! Do you have any that I’ve missed?